Long grain rice with chicken flavour and a tasty mix of red pepper, peas and carrot. 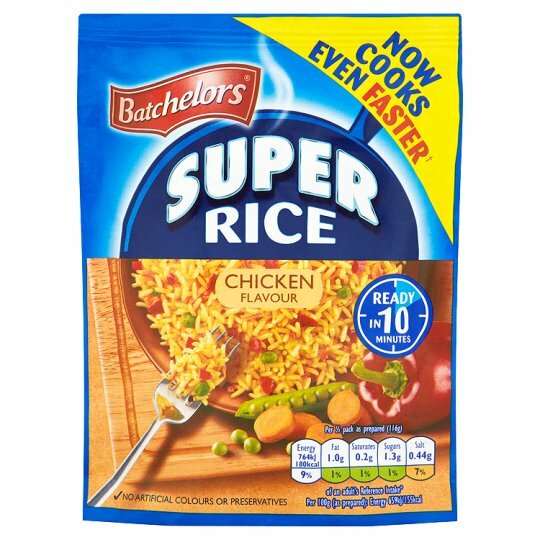 † compared to Batchelors Savoury Rice cook time of 20 minutes. 1. Empty the sachet contents into a large dish suitable for microwaving (minimum 850ml/1 1/2 pint capacity). 3. Cover loosely and microwave on full power for 10 minutes (for best results stir the contents half way through the cooking time). (If you prefer a softer rice, use 375ml (13 fl oz) boiling water and cook for 12 minutes). 4. Stir and stand for 5 minutes before serving. Microwave ovens vary the speed at which they heat food, so for best results you may need to adjust the time/power setting. Hob (From Ambient): 1 Add 325ml (12 fl oz) of water to a saucepan and bring to the boil. 2 Empty the contents of the sachet into the saucepan and cover. Simmer vigorously for 10 minutes or until the water is absorbed, stirring halfway through cooking time. (If you prefer a softer rice, use 375ml (13 fl oz) of water and cook for 12 minutes). 3 Sit back, relax and enjoy! We want to enjoy this product. If you have any questions or comments, please contact our Consumer Relations Department on 0800 222 722 Mon-Fri 9am- 5pm (UK only) (ROI 1850 202929) quoting the codes printed on the pack. (Calls may be recorded).